My Zumba story begins almost 10 years ago. Weighing nearly 300 pounds I was depressed, angry, insecure and very unhappy. I joined the local gym and felt very intimidated by all the typical 'fitness' classes. But with determination and dedication; through hard work and a clean diet I began to see changes. Over the next 2 years I lost 125 pounds and discovered ME! I learned I love to dance! I began with Bellydance and eventually became a Bellydance instructor. But one day, as a fluke I decided to try a Zumba class. Hiding in the back corner, praying not to be noticed, I fell in love! With the music, the beat, the moves, the sheer freedom of it all! I had never experienced anything like Zumba and I was hooked! I decided that day to become a Zumba instructor! 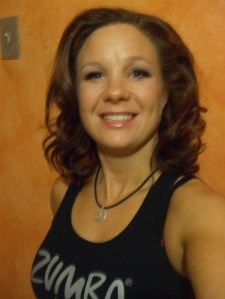 I have now been teaching Zumba classes for nearly 9 years and loving every minute! I have travelled to London, Michigan and 4 times to Orlando to the Zumba Convention to receive invaluable additional training. I am liscensed to teach Zumba, Aqua Zumba, Zumba Gold, Zumba Toning and Zumbatomic ( for kids)and Senatao.